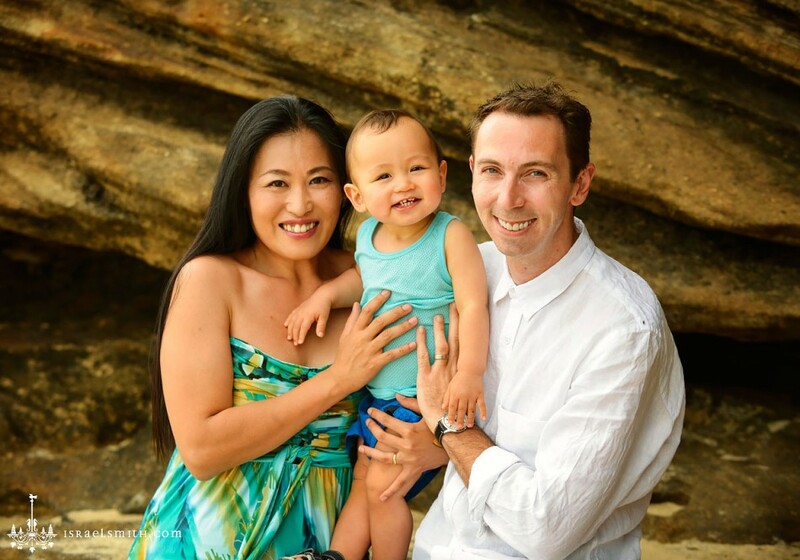 Asako and her family had driven from Avalon, up at the northern end of Sydney’s Northern Beaches, to Bronte – about an hour’s drive away in the Eastern Suburbs – for their family portraits. I was a bit worried about the weather, and if we’d get rained out or not, given how far Asako had driven to see me! I was so humbled that they’d driven so far to have me photograph their family, that I was determined to make it work, one way or another. Most people, when they think of the beach, think of rich, vibrant colours with lots of sunshine. Not this day. It was cloudy, overcast, and generally pretty flat. My work was ahead of me to give this beautiful family a series of portraits that captured their fun, energy, and vibrancy without the help of vivid sunshine light. A lot of photographers say that they love cloudy light. It is really flattering, it is soft, and it is fairly even. But it is also directional from above (throwing heavier shadows under eyes, nose, etc), and it doesn’t always give rich colours. 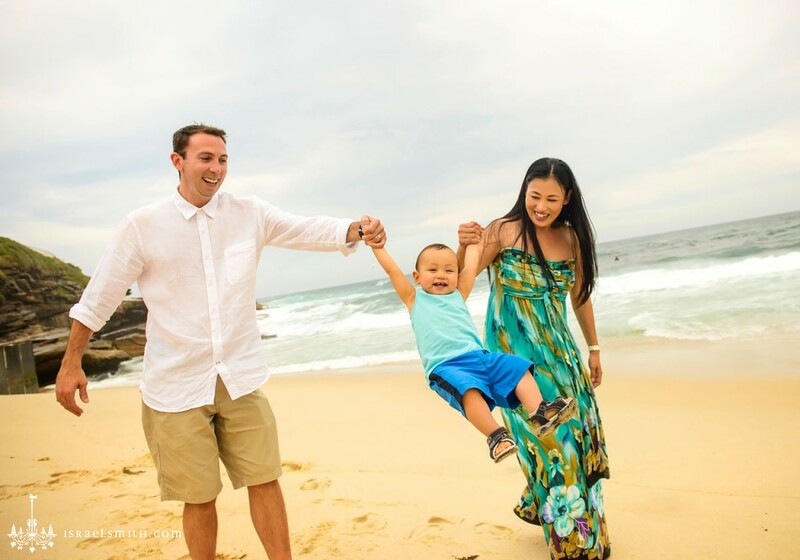 Instead, cloudy day family portraits tend to have a subtler contrast and colour palette. One of the great things about cloudy light is the ability to shoot directly out to sea, and not lose any of the detail in the ocean and sky behind (as in the first image above). If I shot this image on a sunny afternoon, I would either be fighting with direct sun in the family’s face – leading to squinty eyes and brutally harsh shadows – or I would be dealing with such an extreme brightness difference between my family and their background, that the family’s faces would be too dark, and the background would be overexposed and too bright. Cloudy light – as shown above – means I can shoot straight out to sea and get the results I want. The trick with shooting family portraits in cloudy light is to understand how to give it shape, direction and contrast. 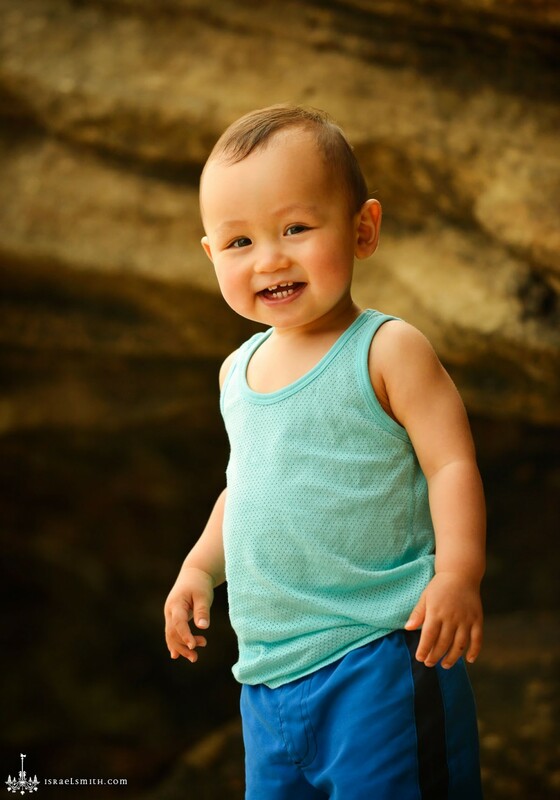 In the portrait of Asako’s beautiful son above, and the whole family below, I used a tall, dark cliff to remove some of the light on the right side of the shots, and create some contrast and shape in the family’s faces. This makes the shot more interesting to look at, and gives their faces depth and character.